In the south west of Morocco near the bohemian town of Essaouira, is a small area of upmost national importance and pride that houses the source health and cosmetic excellence plus anti desert encroachment: The argan trees Moroccan organic argan oil. Moroccan argan oil is now used widely throughout the world after being truely discovered in the west, after the turn of the millennium, as a source of natural health and cosmetic excellence. The benefits of argan oil have been known widely throughout the Berber culture for hundreds of years and these Moroccan women have kept to themselves what argan oil can bring to a healthy life and the aging of skin. Production can be seen throughout the souks of Essaouira between the beautiful Moroccan riads of Hipmorocco. 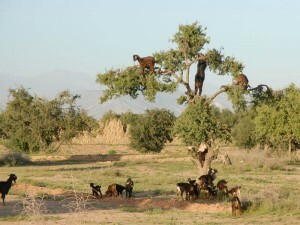 Production of Argan oil has traditionally been relied upon the Moroccan goat who would climb the intricate wizened branches of the argan tree and feast on the fruit pits. After which the processed fruit would be collected from the animals waste and ground by hand using small stone mills to release the fragrant argan oil. Current methods employ more machinery however the difficulty of extracting the argan oil in this vital step of production means that the human hand is still the most effective means. 20 hours of labour go into the production of just 1 litre of this magic potion resulting in its high cost but also representing the true benefits of argan oil. The benefits of argan oil are seen most readily in the tremendous moisturizing benefits for both hair and skin. With high levels of vitamin E, essential fatty acids and antioxidants, argan oil restores each strand of hair and hair cuticle, keeping them moisturized for long periods after use. This ungreasy oil when applied to the face, and particulary under the eyes, protects the skin from free radical damage and has been proved to guard highly from aging skin. The culinary benefits of argan oil are in both taste and health benefit. This nutty oil is commonly used as a hummus like breakfast dip or simply for cooking Moroccan tagines and couscous. It has been proved additionally to lower cholesterol, prevent against certain cancers and reduce the risk of cardiovascular disease. This endangered UNESCO protected plant offers so much to the people of morocco, especially in the creating of womens cooperatives and co-operative finance, offering Moroccan women a greater power and authority in this traditionally male oriented culture. A truly unique produce of this beautiful region of Morocco between Essaouira and Agadir to the south, argan oil has a multitude of benefits both personally and socially and is so greatly accessed from the hand selected boutique riads in Essaouira of Hipmorocco, making your memorable stay in Morocco that much more. This entry was posted on Saturday, May 11th, 2013 at 12:37 pm	and is filed under Beyond Marrakech and the Atlas Mountains, Marrakesh Excursions. You can follow any responses to this entry through the RSS 2.0 feed. Responses are currently closed, but you can trackback from your own site.